“STCU has for many years been an extremely generous supporter of higher education in general and WSU Spokane in particular,” said Nancy Fike, director of Development for the Elson S. Floyd College of Medicine. The credit union’s efforts will be recognized this fall at the WSU Foundation gala in Pullman. Tom Johnson, CEO of STCU, says education is in the credit union’s DNA. Although membership is open to anyone in Washington or North Idaho, the credit union was founded by a small group of Spokane teachers. “Our original connection to WSU Spokane was the training for K–12 educators that occurs on campus,” he said. As the campus has grown, so too has STCU’s commitment to it. The credit union sponsors a wide variety of student orientation activities, including the popular scavenger hunt during new student orientation each August. STCU sponsorships for the College of Pharmacy include lunches for doctor of pharmacy students who attend career presentations each semester. STCU also provides sponsorship dollars toward Pharmacy Dean Gary Pollack’s annual welcome back BBQ each August. For the College of Nursing, STCU-sponsored activities include welcome luncheons for incoming nursing students, faculty/staff professional development activities, and the Na-ha-shnee Camp financial literacy day for Native students. This past year the credit union helped fund the college’s inaugural doctor of nursing practice white coat ceremony. STCU’s most recent gift is $50,000 to the Spokane Teaching Health Clinic under construction on the WSU Spokane campus. The primary care clinic will provide care from medical residents working alongside health sciences students from WSU and Eastern Washington University. Construction began in spring 2015, with the clinic expected to start serving patients in fall 2016. STCU’s donation earned it naming rights for a community education room that can also serve as two classrooms. “We saw the effort of the three partners of the Spokane Teaching Health Center (Empire Health Foundation, Providence Health Care and WSU Spokane) to work together,” Johnson noted. That effort impressed the credit union’s leadership. When WSU decided to build a clinic across the street from STCU’s Schade Tower branch, the credit union knew it wanted to be involved. STCU’s involvement in the clinic impressed WSU as well. 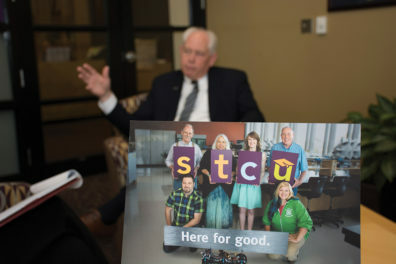 “The community education room is a fitting connection given STCU’s longtime interest in both education and community,” said Fike. 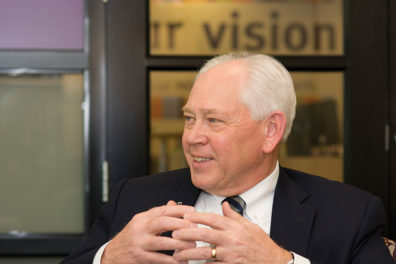 There are other connections between the largest consumer-based financial institution in the region and WSU Spokane, not the least of which is the growth of both. STCU and WSU Spokane are working together to make the campus and Spokane’s University District a great place to live, work and play. STCU is doing its part by being “here for good” each day.